RadioPopper has put together this PX Studio Kit for Canon with 1 Receiver to give photographers the benefit of wireless triggering and TTL exposure control at distances up to 1750' away. The kit includes 1 PX Transmitter and 1 PX Receiver for Canon. The RadioPopper PX-T Transmitter maintains the ETTL/iTTL functions of your camera and flash while adding radio triggering that can fire your flash at distances of up to 1750' depending on the prevailing conditions. The transmitter, which comes loaded with both Canon and Nikon software, mounts to your master flash or commander and allows slave flash units equipped with a PX Receiver to receive E-TTL or i-TTL signals by radio without the limitation of having to be in line of sight with each other. Put simply, the RadioPopper enhances your ETTL/iTTL system by allowing it to act like a radio slave setup. The 16-channel PX-T Transmitter has an auto-search feature that seeks out the cleanest channel for use at your specific location. Several flash units can added to up to 3 groups that can be controlled and fired simultaneously or group by group. There are no wires or shoe mounts on the unit, instead the transmitter is touch-fastened to the top of your master flash. While DSLRs can use up to 1/250 second sync speed, the PX system also supports high-speed sync speeds up to 1/8000 sec. The PX Transmitter gets approximately 25 hours of power-on time from the two included AAA batteries. It requires use of the PX Receiver for normal operation. The RadioPopper PX-RC Receiver works together with the PX-T transmitter to maintains the E-TTL/i-TTL functions of your camera and flash while adding radio triggering that can fire your flash at distances up to 1750' away. While the receiver is compatible with both Canon and Nikon flash units, this version comes with a Canon mount. When used with the required PX Transmitter on your master flash or commander, slave flash units equipped with the a receiver can get E-TTL/II or i-TTL signals by radio which are then translated into IR commands without the limitation of having to be in line of sight with each other. 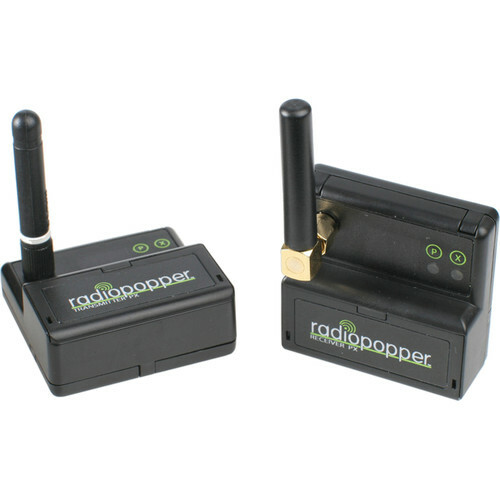 Put simply, the RadioPopper enhances your E-TTL/i-TTL system by allowing it to act like a radio slave. The 16-channel receiver allows you to cluster flash units in up to 3 groups that can be controlled and fired simultaneously or group by group. The PX-RC gets approximately 25 hours of power-on time from the two included AAA batteries.